When tramp oils combine with other contaminants in coolant they can form a sticky substance that clogs lines and sprays. When they hit the tool, the cooling effect of the coolant is reduced, causing shorter tool life, product staining, inaccurate tolerances, and a smoky atmosphere in the plant. 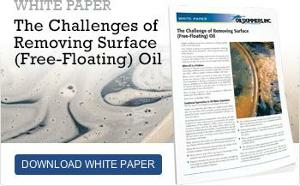 Discussions with machine tool manufactures, coolant suppliers and plant personnel indicate that keeping tramp oil from seeping into coolant is virtually impossible. Since it cannot be prevented from entering the coolant, the only solution is to remove tramp oil continually. This has to be done whether the oil is generated by continuous small leaks from equipment, as is often the case, or whether the oil contamination is a one-time occurrence, such as a hydraulic line break. The most cost effective and simple method to combat tramp oil problem is a surface oil skimmer that mounts on the coolant reservoir and continually draws off surface oil. Oil Skimmers come in sizes and configurations to fit all applications, from small individual sumps to large holding tanks. The coolant reservoir also can be modified to increase tramp oil separation, thus further enhancing the value of the skimmer. One system modification reduces water turbulence in the coolant reservoir and creates a quiet area where tramp oils can separate. Extending a piece of sheet metal across the tank or reservoir so coolant can flow under but not over the sheet metal will serve as a baffle and create the quiet area needed for effective oil separation. Another modification prevents the coolant from plunging into the reservoir. Plunging breaks tramp oil into smaller droplets and makes it more difficult for the oil to reach the surface. Adding a laminator plate or elbowing the inlet below the level of the liquid are two easy ways to reduce the plunging problem. Where the plunging and turbulence cannot be avoided, running the skimmer when machines are down has proved successful. By applying these simple modifications to oil skimmers, many companies have been able to extend, and in some cases, double the life of coolant and significantly reduce the other problems caused by tramp oils. In most cases, however, the coolant requires additional treatment, and here the role of the skimmer becomes even more important. A plant engineer who has to decide which equipment he shall use to clean coolant faces many choices and decisions. Should he use a replaceable or permanent media type filter? Is a centrifuge or cyclone needed? Should he treat a portion of the flow or all of it? The answers to these questions depend on the application and experts can guide the engineer through the options. Whatever system is selected, the oil skimmer will enhance the system’s value because media replacement or cleaning is reduced. Tramp oils can blind a filter, decreasing its life span and reducing its efficiency. A system typically has a “dirty” and clean section. The oil skimmer mounts in the dirty section. On some systems where the unit is too small for the flow, there may be carryover that requires an oil skimmer on both sections. Centrifuges operate more efficiently and requires less cleaning if they are not exposed to slugs of free oil. In the presence of a lot of free oil, interfaces can shift and cause oil to exit with the coolant. Solid and/or metal chips are removed from the coolant with magnetic separators and hydrocyclones. Tramp oil should be removed before the metal chips to eliminate further emulsification and to help reduce oily build up in the system, which would be require further maintenance and reduce efficiency. Break down the coolant, discharge the water and dispose of the concentrate. Haul away the entire coolant mixture. Ultra filtration and distillation are the most common ways to break down the coolant mixture. Each method works better if any oil in the mixture is first removed. When free oil is eliminated from the coolant, the distillation process requires less energy; depending on the system, ultra filtration efficiency increase from 20% to 70%. Certain coolants can be discharged into municipal sanitary sewers if they are oil-free. Waste haulers typically charge more if the oil has not first been removed from the mixture. Some will not even take any mixture with oil. The solutions to this problem is to skim the tramp oil, then burn or dispose of it. Many plants mix tramp oil with their fuel oil or sell It to waste oil processors. When using oil skimmers to collect tramp oil, especially on a continuous basis, a decanter can increase the system’s usefulness returning the coolant to the reservoir and channels the concentrated tramp oil to a collection tank. Not only is coolant lost but disposal of the tramp oil becomes more difficult and the frothy tramp oil that is removed contains coolant that will settle out in a quiet container. Continual removal of tramp oil extends the life of coolants. The use of oil skimmers to remove tramp oils is beneficial in every phase of coolant use, treatment, and disposal. Units are available for all size reservoirs and have demonstrated they can increase efficiency and reduce the loss of time and money.